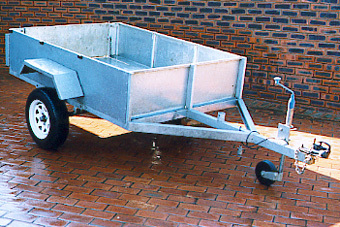 Daan Trailer, has a fully galvanised chassis. These trailers are sold with a COR ( Certificate of road worthiness' ) and a Jockey and Spare wheel. The axel is held in place with a 5 blade spring system. The trailer can carry op to 999Kg's. The trailer is ideal for camping, garden refuge and just about any thing that you want to load. This trailer was built specifically to carry one pallet of bricks at a time to my property. The trailer is in very good condition. It also has disk brakes. The dimensions of the loading bed is 198cm x 122cm. There is plenty places to hook straps in to. Click on the picture to enlarge.